"Like athletes, preachers carry inside them the voices of their most challenging coaches--people who have encouraged them to dig deeper, stretch farther, and more faithfully pursue their craft and calling. In these crystalline essays, Walter Brueggemann is that voice again, shaking us free of the dust of our own diminished expectations, bolstering our best instincts, and consistently pointing us toward a gospel that would make the powers and principalities tremble. --Scott Black Johnston, Senior Pastor, Fifth Avenue Presbyterian Church ""Richly informed by Scripture, this superb book is a must-read for preachers and, indeed, for laity who love the Word. 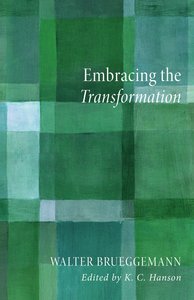 Brueggemann's theological interpretation of the biblical text strikes the mind and heart and calls out the church as an alternative community to embrace the work of transformation God is doing in the world. Brueggemann's books always inform and inspire, but as I read this extraordinary text, I found myself over and over again giving thanks to God."" --Tex Sample, Professor Emeritus of Church and Society, Saint Paul School of Theology ""In this splendid collection of essays, we encounter the Walter Brueggemann we have come to expect--wise, edgy, original, provocative, stimulating to preachers, and deeply encouraging to a church in quest of a prophetic, bold, and vital faith."" --Thomas G. Long, Professor of Preaching, Candler School of Theology, Emory University "